The graphics below show the five matches the model has picked out this weekend where the most appears to be at stake for both clubs involved, along with how their respective chances of achieving their main goal varies with each outcome. These can be read in conjunction with the match preview graphics – powered by the same model – to get a steer on what’s likely to happen. 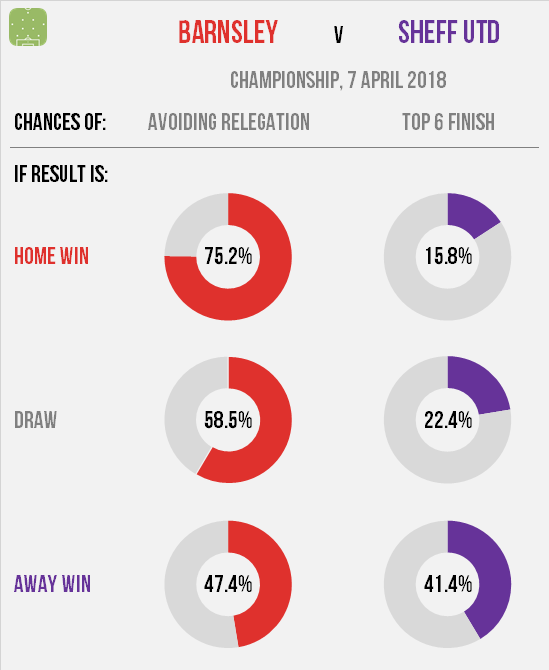 For Barnsley, a win here could boost their survival chances to around 3 in 4, assuming all the other games in this Championship season pan out as the model expects, while a defeat would leave things looking pretty 50:50 for them. This wouldn’t be a disaster by any stretch of the imagination – not least because they have a game in hand – but this is definitely an opportunity that they won’t want to waste given that they sit five points from safety. The Blades meanwhile need a win if they’re to have any realistic hope of securing a play-off place in an unusually tight race: even a draw would put their chances at below 1 in 4. This is one of only two remaining matches against bottom half teams – the other being at Birmingham – so they won’t have many better chances to put three points on the board. 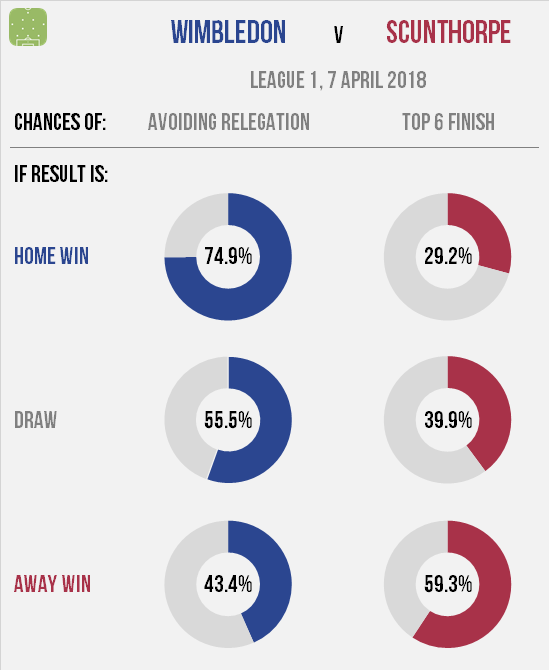 As two of five teams separated by a single point and scrapping it out for the lower two play-off places, this encounter appears critical to both sides’ promotion chances. Only a win will realistically sustain either club’s hopes of making the final top six, with even a draw reducing their prospects to below one in three. Both have yet to play three more of the top eight this season, which explains why the model sees this particular match as being so pivotal. As for Barnsley and Sheffield United in the division above, this fixture unites two teams at opposite ends of the table. 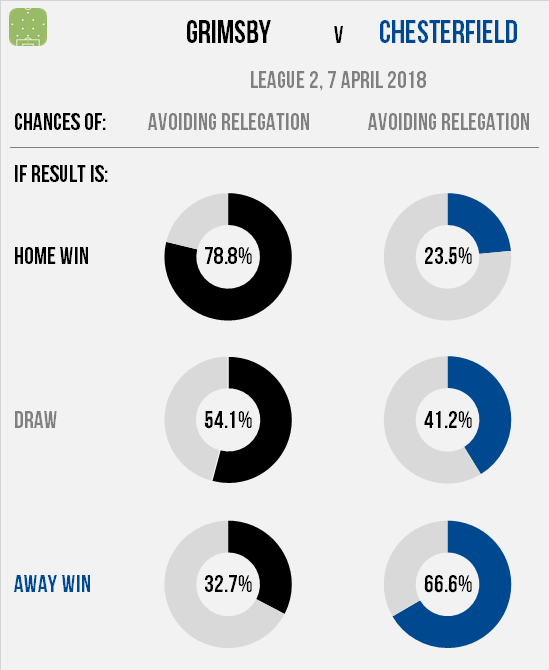 Wimbledon need a home win to put some much-needed distance between themselves and the bottom four, with defeat leaving them vulnerable to a return to League 2. Visitors Scunthorpe meanwhile should be going all-out for an away win that would significantly strengthen their hand in the play-off battle: anything less than three points is likely to see them drift behind the main challengers. Finally to League 2, where Notts County and Coventry have the opportunity to significantly strengthen their claim to a top seven spot at each other’s expense. County are in a slightly better position overall – as the league table will attest – and even defeat would leave them more likely than not to make the play-offs. However a win would boost their chances tantalisingly to over 90%, with the visiting Sky Blues able to nudge their own prospects almost as high if they can pick themselves up from the last week’s harrowing 6-2 defeat. Let’s finish with what is unmistakably a relegation six-pointer. If Grimsby can record a (long-overdue) win then they will inflate the cushion between themselves and Chesterfield to seven points: enough to ease the pressure significantly despite the visiting Spireites having three games in hand. 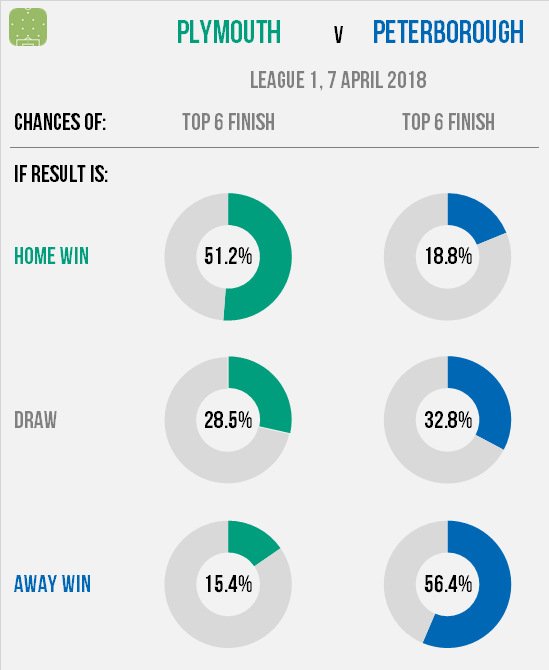 Even a draw would make them likelier than not to survive, although the better than 3-in-4 chance that three points would provide makes throwing caution to the wind a no-brainer here. An away win however will close the gap to just one point: a margin that Jack Lester’s side went on to overcome in around two-thirds of the simulations I ran.